The cast of Sensual Daydreams was founded in 1992 at the historic Oriental Theatre. We are located on Milwaukee's east side in Wisconsin. Sensual Daydreams is dedicated to putting on a great show that is not only fun for us, but also our audience. The cast performs the second Saturday of every month. It was midnight on Saturday January 7, 1978, that The Oriental Theatre presented their first regular showing of the 1975 cult film, The Rocky Horror Picture Show. The film was shown weekly to huge crowds, but without any cast. In fact, the Oriental Theatre management would round up members from Illinois casts to perform at the theater's biggest shows! 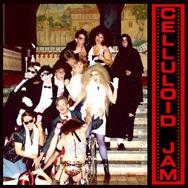 It wasn't until 1984 when Betzi Vojiko and Lory Kramer Peacock formed a cast, named The Celluloid Jam. That year, people from other casts joined the Jam here in Milwaukee. By 1985 they were known as The World Renowned Celluloid Jam and were said to be one of the best shadow casts around. Most of the props that remain at the theater were made by members of the Jam, including their grandparents! For instance, our Rocky pommel horse, Riff Raff's window, and our weight set was made by a true Rocky Horror veteran, Bruce Cutter. Unfortunately, the cast was disbanded in May 1992. The film continued to thrive for months, but without a cast at The Oriental Theatre. Theater management asked Dawn Tracy, an employee who had been part of The Celluloid Jam, to form a new cast. Dawn contacted her good friend Trish Thompson (also a Celluloid Jam alum) to help create the new cast. So with a new set of rules, the two founded the cast of Sensual Daydreams was formed on September 26, 1992. Sensual Daydreams still performs to this day at the same beautiful theater. We have been featured on local news stations, countless times in our local newspapers, on radio spots, and, our proudest press appearance, in Premiere magazine in June 2005. The article not only featured us, but was about the Rocky Horror community as a whole. Our cast hosted The Ordinary Healthy Convention in 1996, which started the tradition of performing Shock Treatment regularly at Rocky Horror conventions. The cast of Sensual Daydreams may not perform every weekend as we did years ago, but we continue to pull in crowds month after month. Sensual Daydreams is very proud to perform in the theater that is tied for the record of the longest continuous showing of The Rocky Horror Picture Show in the United States. The Oriental Theatre opened its doors on July 2, 1927: it is a beautiful movie palace with a two story lobby and an Oriental theme that extends even to the ticket counter and the bathrooms. The theater has had very few changes since that opening: even some of the furniture is the same! The theater was bought by Landmark Theaters in 1976. The Oriental is known not only for showing unique films, but also hosting live performances in the 1980s. In 1988, two theaters were added underneath the balcony and on each side of the main theater, without impacting any of the original themed decorations. The Oriental Theatre has won many awards, including "One of the 10 Best Movie Theatres in America" in 2005 by Entertainment Weekly. Sensual Daydreams is truly thankful to perform in such a great theater. Not only do we get to celebrate The Oriental Theatre's record year after year, but the cast is provided with a large cast room, prop room, costume room, and an orchestra pit. The rooms are filled with vibrant colorful shapes and a Dr Frank-N-Furter wall mural! (Thank you, Celluloid Jam!) Not many casts have a place to get ready and store their props. None of this would be possible without the great staff and management that continue to help us thrive! The management at the historic theater hope to keep Rocky Horror alive in the great city of Milwaukee until the end of time!